Download Barcode Label Software – Corporate Edition to design barcode coupons with arc, text, line, pictures, signatures and other designing objects for different commercial industries. Generate multiple copies of printable barcode stickers using batch processing method. 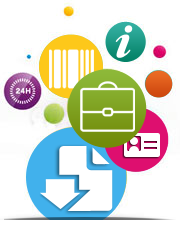 Copy and paste designed barcodes at specifies Windows application. Specify barcode header, barcode footer and barcode value accordingly. Support all linear and 2D barcode font standards. Save generated barcode images in any image file format.